How to do tadasana. All on Video! 1. Stand with your feet together. Big toes touching with the heels resting behind the second and third toes. (There will be a slight space between your heels). Press the 4 corners of the feet (big toe mound to pinky toe mound, inner heel to outer heel) into the floor. The weight should be evenly distributed through the feet. Lift the inner arches up and firm the outer ankles in. 4. Lengthen through all four sides of the torso and firm the outer hips. 6. Keep the neck long and even on all four sides. 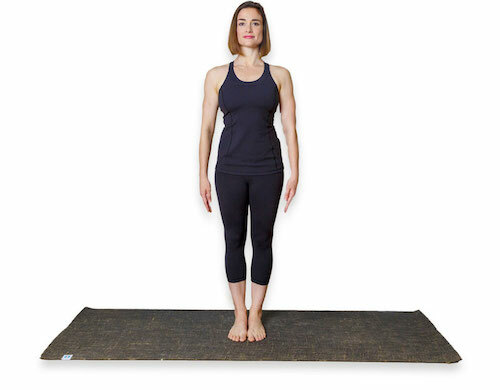 Make the chin parallel to the floor and balance the crown of the head over the center of the pelvis. (Sense the plumb line of the body - an imaginary line that travels down the center dissecting the body into two hemispheres). Keep the tongue soft in the mouth and feel a slight space between the top and bottom jaw. 7. Keep the eyes soft and the gaze wide as you breathe in and out through the nose with awareness and ease. Life is a beautiful mess, embrace it!